While protests against controversial the Citizenship (Amendments) Bill, 2016 continue to rock Assam and other states of Northeast, BJP chief Amit Shah on Tuesday said in West Bengal that all Hindu Bengalis will be granted citizenship with the passage of the Bill. “I want to assure that all the Bengali refugees will be given citizenship under the Citizenship Bill. Also, we are committed to stop illegal immigrants. Therefore, this Citizenship Amendment Bill is necessary as it is meant to restore the lost dignity of Bengali Hindus. The TMC government has done nothing for the refugees but we will give them citizenship,” he said. 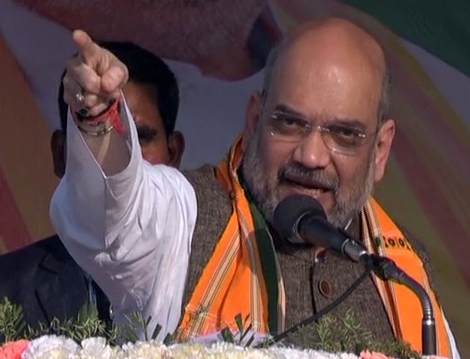 Speaking at a rally in Malda, Shah said his party would make the Citizenship Bill a major poll issue in West Bengal. “This will be the main agenda in Bengal during the Lok Sabha polls,” he said. . Taking a dig at West Bengal chief minister Mamta Banerjee, he pointed out that the Trinamool members had staged a walkout from the Lok Sabha when the Bill came up in the House. “I would like to ask Mamata ji why is she creating hurdles and opposing the bill. Is she scared of losing her vote-bank. She needs to answer this?” Shah said. He also asked Banerjee to spell out whether her party would back the legislation in Rajya Sabha. “I am sure; she won’t, as she is afraid of losing her vote bank. This Bill will be an election issue for the 2019 polls in the state,” he said. Regarding the issue of National Register of Citizens (NRC), he urged Hindus, Buddhists and Sikhs to not live in fear.